My friend Eve lives on a private street with four properties off of a main road. The mailboxes are lined up all four on one metal frame. One of those properties is owned by a hoarder. It is a corner property so it’s really visible from the main road. Its a really trashy property. Eve and the other neighbors just hate them. 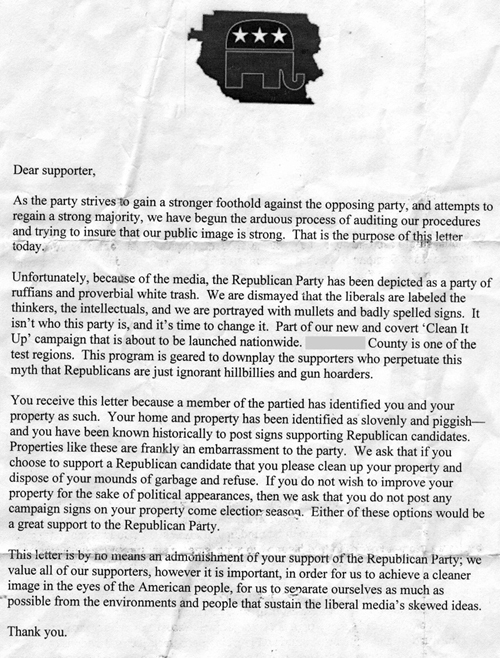 A few weeks before the elections, this flyer started appearing. Eve suspects it might be one of the neighbors that made it– who knows.